This keyless remote programming instructions work for 3B remote with part # 88959920, 10205241, 10205239, 10205240, 12522338, 10063533, 10205239, 12522337, 12522339, 12522356, 10097895, 10097894, 10205674, 10092854, 10097894, 10063534, 10178738, FCC id ABO0103T, GQ43VT1, ABO0104T, ABO0116T on the back of it. 1. Make sure the ignition is in the OFF position. 2. 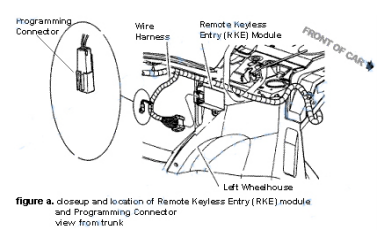 Locate the programming connector in the drivers side trunk. It is a plastic connector with 2 wires leading to it. It is not plugged into anything. 3. The programming connector has two terminals. Connect the terminals with a suitable jumper wire. The locks will cycle to confirm programming mode. Keep the jumper wire connected. 4. Press the LOCK and UNLOCK buttons on the remote simultaneously. The door locks will cycle to confirm the remote has been learned. Your new remote has been programmed and all previous remotes have been erased. 5. Repeat the previous step for every remote (including old ones).